Custom Label Spring Bottled Waters - 8 oz. Custom labels on an 8 oz Natural Spring or Purified Water in Clear, Eco Smart Bullet ECO bottle. Perfect addition to any event; bridal showers, baby showers, weddings, festivals, concerts and more! Full color, full-wrap, waterproof label and slim, clear frosted flat cap. Get "Green with Envi" The first environmentally friendly bottle at regular bottle prices! Made of 25% plant based materials and 75% recycled PET. All water monitored and tested for taste and purity. Ask about Low Pallet Shipping Rates. 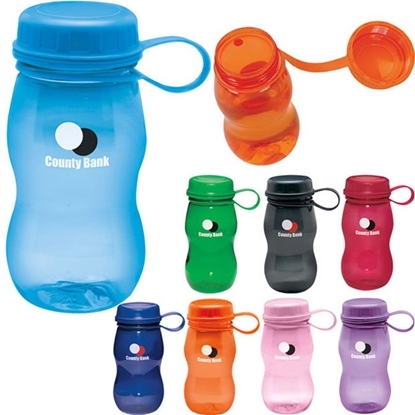 Features: Heavy weight PET 1 durable plastic bottles. Water is 100% spring water. This color 21 oz. 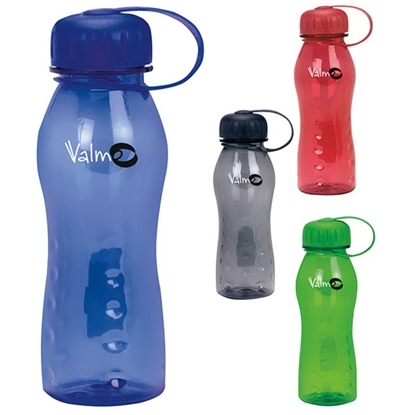 value bottle is best for the budget-conscious and is made of high-density polyethylene plastic. Measuring 2 7/8" dia x 8" h, it fits any standard bike cage. The bottle reaches its 21 oz. capacity when filled to the rim. BPA free. Made in the USA. 16oz. Sports Bottle. BPA Free. 32oz. Sports Bottle. BPA Free. Must specify push top or straw in order comments, if you have a preference. 20 oz. sport bottle made of high-density polypropylene ethylene. Measures 2 7/8" dia x 7" h and fits any standard bike cage. The bottle reaches its 20 oz. capacity when filled to the rim. BPA free. 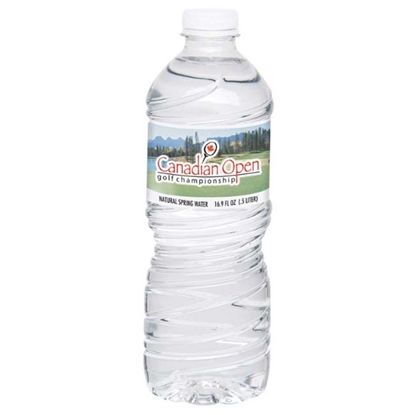 For the budget-conscious, the 28 ounce value bottle is made of high-density polyethylene plastic. It measures 2 7/8" dia x 11" h and fits any standard bike cage. Bottle reaches its 28 oz. capacity when filled to the rim. BPA free. Made in the USA. 24oz. Bike Bottle. BPA Free. 28 oz. sport bottle made of high-density polypropylene ethylene. Measures 2 7/8" dia x 10" h and fits any standard bike cage. Made in the USA. The bottle reaches its 28 oz. capacity when filled to the rim. BPA free. Give a great "twist" on your marketing campaign! Refreshing natural spring water is a great healthcare event giveaway. The 16.9 oz. twist cap bottled water measures 2 1/2" x 7 3/4" x 2 1/2" and must be ordered in packs of 24. Nutritional information must appear on label and Friday ground shipments not recommended during cold weather. Your customers will appreciate this item especially during those summer tradeshows! 27 oz. Poly-Clean (R) bottle made of shatterproof PET plastic. 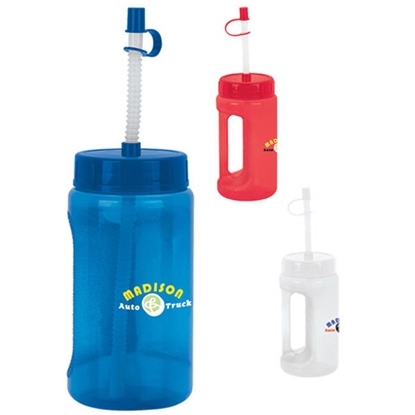 Features a push-pull, easy drink-thru lid plus an easy-to-fill, wide mouth that makes adding ice cubes or stirring simple. 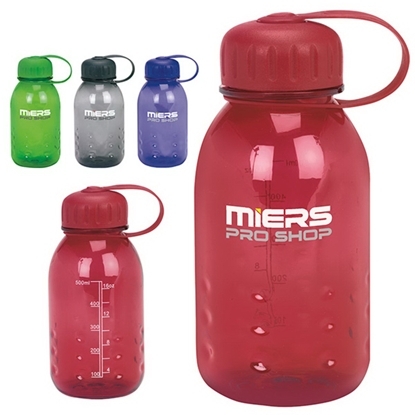 Made in the USA, Measures 3 1/8" dia x 9 1/2" h and reaches its 27 oz. capacity when filled to the rim. 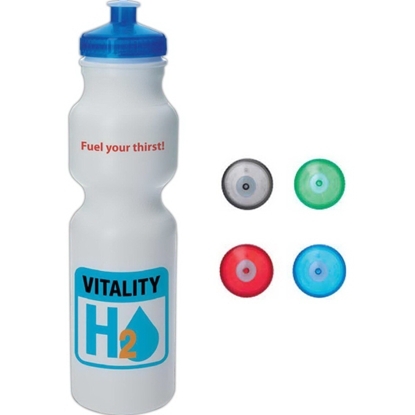 BPA free, good value.This squeezable sport bottle is earth friendly and great for the gym. The more cup holders it sits in, the more visible your brand! Our 32 oz. 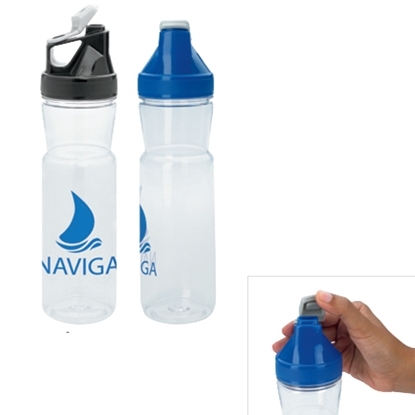 eco-friendly Easy Grip Water Bottle is ergonomically shaped with a bubble-textured base that fits into your cup holder. 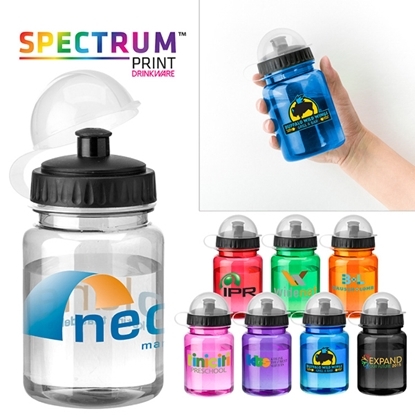 Made in the USA and BPA-free, this 10" H x 3 1/4" diameter bottle comes in beautiful translucent colors, and features matching plastic twist-on lid with pull-up drink spout. Your silkscreened logo gets the best exposure. 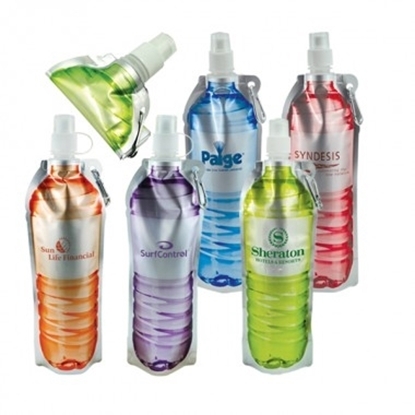 An ideal giveaway for your trade show goodie bag! 31 oz. 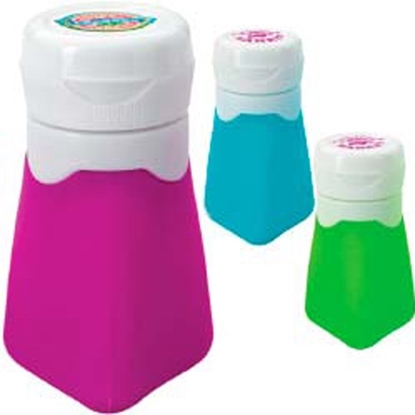 Gripper Poly-Clear(R) bottle made of shatterproof PET plastic. 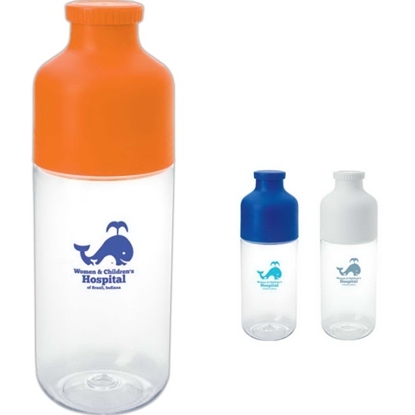 Features a flip-top, drink-thru, super-sipper lid. The easy-to-fill, wide mouth makes adding ice cubes or stirring simple. Made in the USA. Measures 3 7/16" diameter x 8 1/2" h and reaches its 31 oz. capacity when filled to the rim. BPA free, good value. 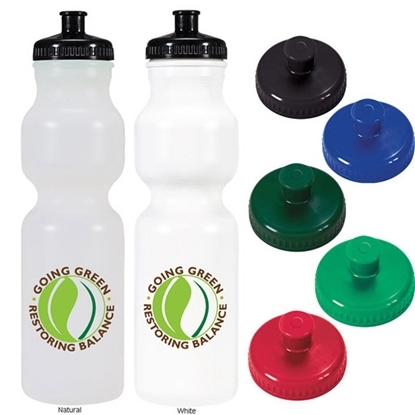 This squeezable bottle is earth friendly and great for the gym. Adorable, silver frame, animal water bottles. 12oz. flat bottle. BPA Free! Silver carabiner included. Push pull lid with tethered cap. Freezable and folds flat for easy storage. CPSIA compliant. 18 oz. handle bottle made of PVC plastic. Features a useful handle grip for users on the go. Made in the USA. Measures 3 1/4" dia x 6 1/2" h and reaches its 18 oz. capacity when filled to the rim. BPA free. Imprint may distort due to seams. This handy bottle is guaranteed to receive frequent use! Need a drink on the move, try our 1.25 oz. Go Gear (TM) Travel Bottle! Never waste a drop of product again with this flexible silicone travel bottle. 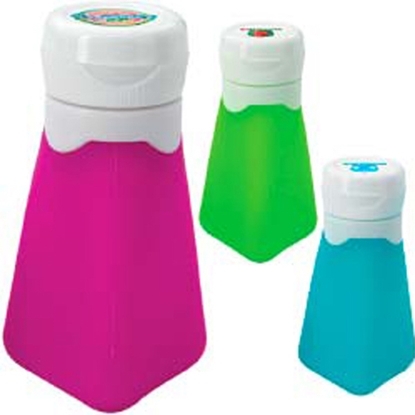 This bottle with a flexible silicone body measures 1-3/4"w x 2-5/8"h x 1-1/2"d and is available in a variety of bright colors. 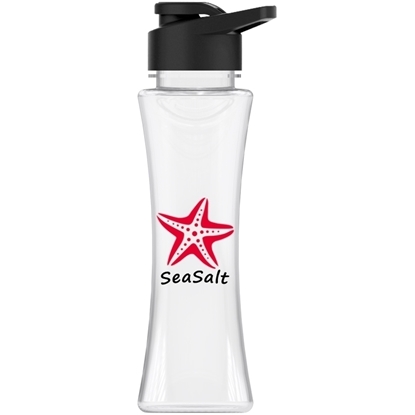 The product features a wide opening for easy filling and cleaning with tons of space for your design or logo. Received Best in Category at 2012 Houseware Design Awards.Airline carry-on approved. Flexible silicone body. Collapsible water bottle. Folds flat for easy storage. Freezable. BPA Free. Silver frame flat bottle with unique bottle design decoration. Silver carabiner included. Push pull lid with tethered cap. 21 oz. bubble bottle made from acrylostyrene, It comes with a removable splash guard with a straw opening. Measures 3 1/4" dia x 9 15/16" h and reaches its 21 oz. capacity when filled to the rim. BPA free, good value. This bottle has the look of polycarbonate but not the price. Bottle coes with a stopper to aid drinking. Need a drink on the move, try our 2 oz. Go Gear (TM) Travel Bottle! Never waste a drop of product again with this flexible silicone travel bottle. 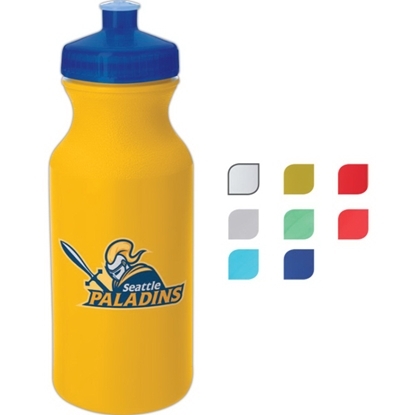 This bottle with a flexible silicone body measures 1-7/8"w x 3-3/8"h x 1-3/4"d and is available in a variety of bright colors. 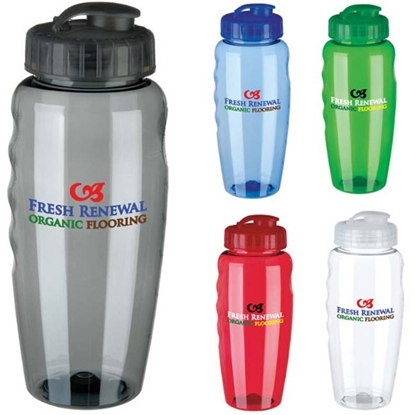 The product features a wide opening for easy filling and cleaning with tons of space for your design or logo. Received Best in Category at 2012 Houseware Design Awards. Airline carry-on approved. Flexible silicone body. Our New 17 oz. Tritan™ Curve Bottles with NEW Drink True Lid is molded with food-safe, Dishwasher-safe, BPA Free Tritan™. Ships Assemble-No Extra Charge. FDA Compliant – Safe for Food Contact. Need a drink on the move, try our 3 oz. 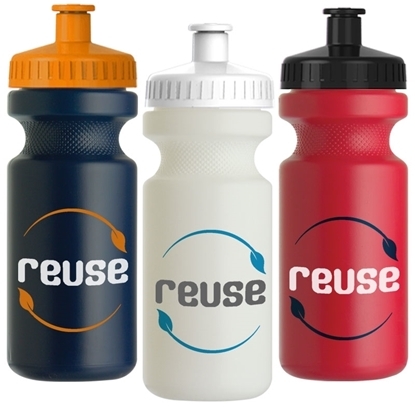 Go Gear (TM) Travel Bottle! Never waste a drop of product again with this flexible silicone travel bottle. 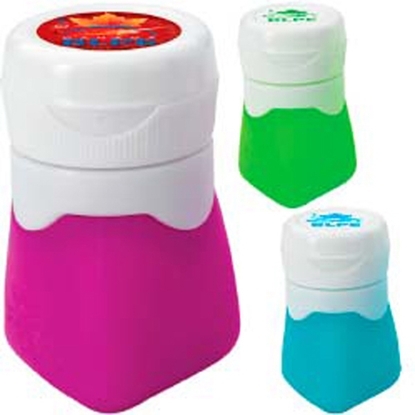 This bottle with a flexible silicone body measures 2-1/4"w x 4-1/8"h x 2"d and is available in a variety of bright colors. 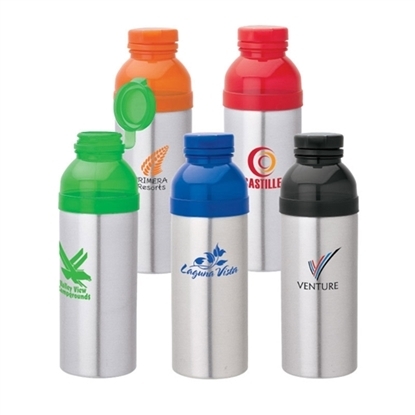 The product features a wide opening for easy filling and cleaning with tons of space for your design or logo. Received Best in Category at 2012 Houseware Design Awards. Airline carry-on approved .Flexible silicone body. 23 oz. serendipity bottle made of Tritan (R) plastic and polypropylene plastic. The top and lid twist off for adding ice and easy cleaning. 23 oz. capacity when filled to the rim. 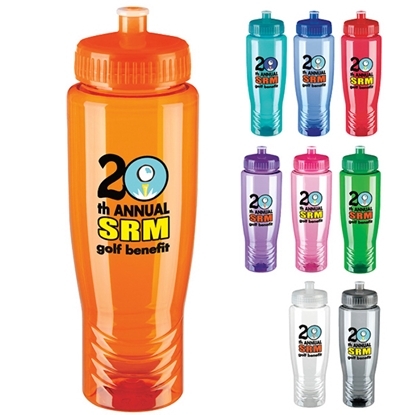 Measures 3" dia x 8 5/8" h.
Sierra Sure-Snap (TM) plastic water bottle. 24 oz. Control the flow! 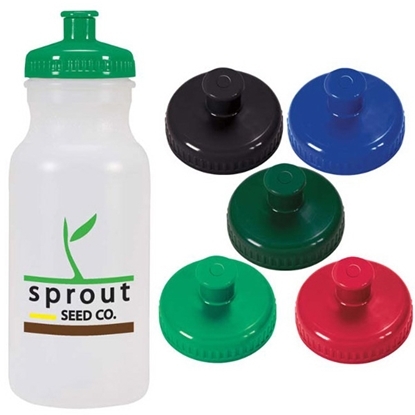 Bold color squeezable LDPE material water bottle with easy-grip black silicone center band accent, matching black twist-off lid with the Sure-Snap (TM) sports valve opening. The Sure-Snap (TM) valve: Built-in one-way valve. No opening and closing. Just squeeze and drink! BPA free. Great for working out or anytime! Measures 9 1/2"h x 2 3/4" diameter. 23 oz. Ariel sports bottle made of Tritan (R) plastic. Great for the gym, picnics, walks and much more. 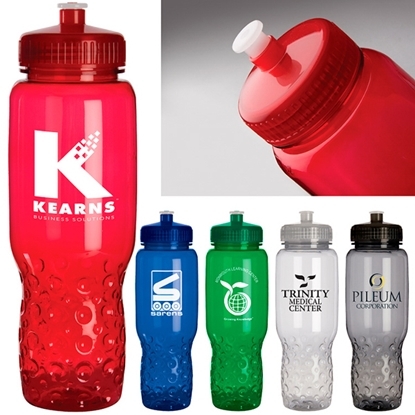 This clear bottle is perfect for all imprint colors and features an easy side-sliding lid. Measures 2 5/8" dia x 10 1/2" h and reaches its 23 oz. capacity when filled to the rim. BPA free, good value. This 23 oz. 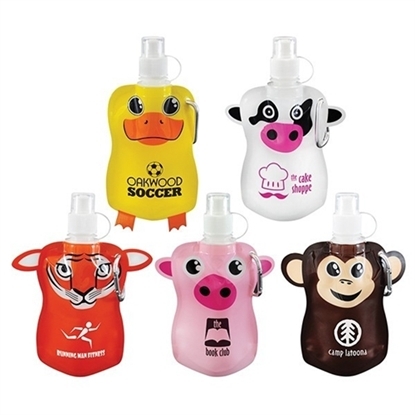 polly bottle made of polyethylene terephthalate glycol plastic and polypropylene plastic is perfect for travel, sports or camping. The attached screw-off lid with loop makes it easy to clip to bags. Great for fitness, ounce chart comes standard. Measuring 3 1/4" dia x 7 3/16" h, it reaches its 23 oz. capacity when filled to the rim. BPA free. 21 oz. slim polly bottle made of polyethylene terephthalate glycol plastic and polypropylene plastic. Great for fitness, ounce chart comes standard. Measuring 3" dia x 8 13/16" h, it reaches its 21 oz. capacity when filled to the rim. BPA free. 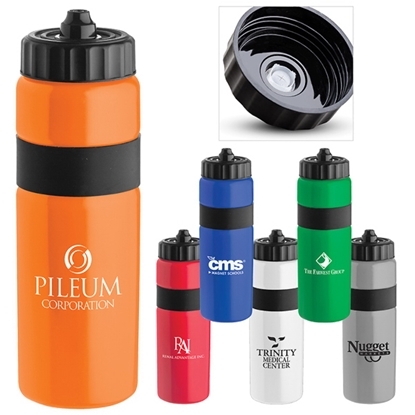 Mypromotionalpens.com offers the largest and best priced selection in Promotional Water Bottles. We will price compete and we won't be under sold. 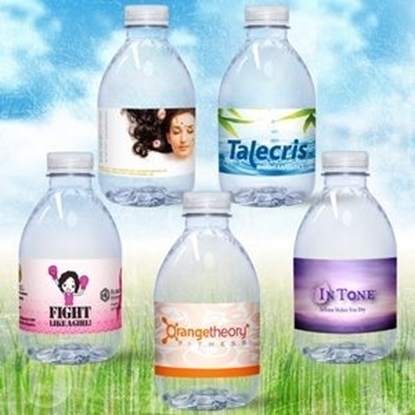 Let our graphic designers make your personalized Water Bottles standout above the crowd at no charge. We won't stop until you are completely satisfied with your custom Water Bottles art proof.Use category search filters on your left to help narrow your search to find exactly what you are looking for.